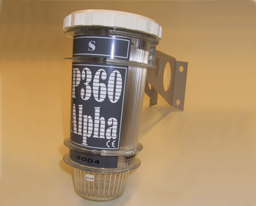 Pathfinder 360 Alpha is an inductive overhead line Fault Passage Indicator, designed to be installed on the pole 3 metres below the conductors, that senses out of balance of electro-magnetic field in a single or 3 phase, solidly earthed HV network at between 6 to 36KV (or equivalent voltages). It will sense both phase to phase and earth faults of values down to a nominal 12 amps, sensing also the surrounding voltage field, to determine whether a fault has been transient or permanent. The presence of the voltage field will also reset Pathfinder on restoration of HV supply. The instrument continuously monitors the residual current and voltage fields from the overhead line conductors and is triggered when it detects fault current above the current/time di/dt threshold curve, passing in the line conductors. High intensity white LED to indicate permanent faults. Red LED to give 24 hour indication of permanent or transient fault. Auto gain feature minimizes the residual field as a result of load imbalance and spikes. Sensing logic incorporated di/dt time curve which mirrors a typical protection curve, incorporating a Phase to phase peak, and earth fault plateau, and IDMT plateau, and an SEF plateau. Dead time suppression of the effects of magnetizing inrush current. Response and reset logic variable according to model type. Option of alarm relay output to link with RTU. Fully tested for Electro Magnetic Compatibility, temperature rise, environmental, and vibration. Powered from long life Lithium battery giving a proven life greater than 10 years.